There were 3 varieties of Kite Hill cheese available at my local Whole Foods. 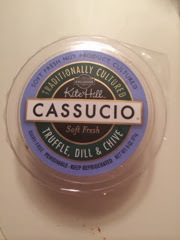 I decided to try out the truffle, dill, and chive variety. My non-vegan fiance and I tried it out on some crackers. You could definitely taste the dill, but it wasn't overpowering. The texture was a little different than I expected. My fiance compared it to ricotta cheese. I was surprised at how light and airy it was. I expected it to be a bit denser. But it was definitely flavorful and a great substitute for "real" cheese. I think it would be great crumbled up and put in a pasta dish or on a salad. Or probably even on a pizza. I wonder if it melts? The only bad thing about this cheese is the packaging, I think. It comes in a non-sealable container, so if you don't plan on eating the whole thing, you'll have to get creative and find a good way to store it. It makes me happy to see that there's a market for high quality vegan cheeses. As more and more people embrace a plant based lifestyle, I can't wait to see what other good "fakes" are developed. Do you have a favorite non-dairy cheese? The primary should be which usually measurement is right for a person, in the event you hae an inferior figure and don't consider very much then it is not wise to obtain 6. 5m Flexifoil Edge one example is and the similar is true intended for in case you are heavy, you don't are interested the 2m HQ Beamer mainly because Kitesurf will likely not necessarily supply you with this enjoyment you would like.